Contract of a sale of land imposed by the need to pay a ransom, dated to his 1st year. Nabû-šumu-libūr, inscribed dAG.MU-li-bur[i 1] or dna-bi-um-MU-li-bur,[i 2] meaning "O Nabû, may (my) progeny / the son stay in good health," (1033 – 1026 BC) was the 11th and last king of the 2nd Dynasty of Isin, the 4th Dynasty of Babylon. He ruled during a period of instability due to incursions of Aramean nomadic tribesmen in Northwest Babylonia. There is very little extant material for his reign. The legal text pictured[i 2] is from his first year. It was found at Kār-Bēlet-Ilāni near Nippur, and details the reimbursement of Nusku-zêra-iddina, the šandabakku, or governor of Nippur, with land, after he ransomed a man named Mudammiqu from the "enemy. "[nb 1] The price was paid in kind, with the text listing various items provided by the purchaser with their cash equivalent, for a total of 420 shekels. It was first published in 1983 and the text provides the earliest recorded price for iron,[nb 2] where an iron dagger of unspecified weight was valued at 2 shekels of silver. It was witnessed by eleven individuals representing the role-call for the elite in Nippur and the god Ninurta is invoked as patron deity of boundaries. A stone duck weight[i 3] inscribed Nabû-šuma-libūr, optimistically titled šar kiššati (“king of the world”),[nb 3] found its way to the Northwest palace of Nimrud, where it was preserved as an antique and rediscovered by Layard in the mid 19th century, and perhaps indicates continued trade. It was marked 30 minas (about 15 kilograms). Ominous portents dated for his reign, are included in a damaged Religious Chronicle of the Seleucid era. [i 4] It records, “a lion was lying lurking and they killed it,” a prophecy fulfilled by the fall of the dynasty. The events at the end of his reign are not known, but northern Babylonia had been overrun by Aramean tribesmen from the west, and the dynasty was followed by the 2nd Dynasty of Sealand when a substantial part of southern Mesopotamia seceded. ↑ Tablet BM 33332 Kinglist A, iii 4'. 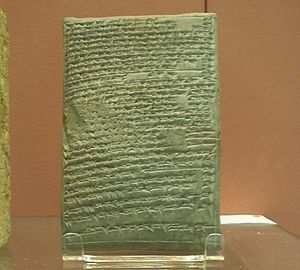 ↑ 2.0 2.1 Tablet BM 139424, purchased in 1982 and on display in room 55 of the British Museum. ↑ Alabaster duck-weight with two panels of cuneiform inscription; top of bird's head lost; abraded, BM 91432. ↑ The Religious Chronicle, tablet BM 35968 (ABC 17) column 1. ↑ The “enemy” is recorded as LÚ.KÚR.MEŠ, and is unspecific. ↑ CAD vol. 17, šumu 4b p. 295. ↑ Dominique Charpin (2002). "Chroniques bibliographiques: 2. La commémoration d'actes juridiques : à propos des kudurrus babyloniens". Revue d'assyriologie et d'archéologie orientale. 96 (2): 186. ↑ Sylvie Lackenbacher (1983). "Vente de terres a un « Šandabakku » sous la IIe dynastie d'Isin". Revue d'Assyriologie et d'archéologie orientale. 77 (2): 143–154. JSTOR 23282184. ↑ Judith K. Bjorkman (1989). "14. Second Millennium B.C. Prices of Iron and Copper". Nouvelles Assyriologiques Brèves et Utilitaires (NABU) (1 (mars)): 12. ↑ J. A. Brinkman, C. B. F. Walker (1985). "Remarks on the Shandabakku Land-Purchase Text from the Time of Nabu-shumu-libur". Revue d’Assyriologie (79): 72–74. JSTOR 23282346. ↑ 6.0 6.1 J. A. Brinkman (1968). A political History of Post-Kassite Babylonia, 1158–722 B.C. Pontificium Institutum Biblicum. pp. 147–148. ↑ J. A. Brinkman (2001). Dietz Otto Edzard, ed. Reallexikon der Assyriologie und Vorderasiatischen Archäologie: Nab - Nuzi. 9. Walter De Gruyter. p. 34. ↑ Stephen Bertman (2005). Handbook to Life in Ancient Mesopotamia. Oxford University Press. p. 97.